';For thousands of years people have been using the skills we describe in this book to engage in conversations with others. What isn't as prevalent, however, is instruction--especially in primary gradesin which we engage students in productive conversations about academic ideas. This book fills that very big need.' --Jeff Zwiers & Sara HamerlaTalk about content mastery . . .Primary teachers, you wo… n't want to miss this: if you're looking for a single resource to foster purposeful content discussions and high-quality interpersonal engagement, then put Jeff Zwiers and Sara Hamerla's K-3 Guide to Academic Conversations at the top of your reading list. Whether your students love to talk or not, all must be equipped with key conversation skills such as active listening, taking turns, posing, clarifying, supporting with examples, and arguing ideas. This ready resource comes packed with every imaginable tool you could need to make academic conversations part of your everyday teaching: Sample lesson plans and anchor charts Guidelines for creating effective prompts Applications across content areas, with corresponding assessments Rubrics and protocols for listening to student speech Transcripts of conversations and questions for reflection Companion website with video and downloadable resourcesTens of thousands of students in the upper grades have reaped the benefits of academic conversations: high-quality face-to-face interactions, increased motivation, stronger collaborative argumentation skills, and better understanding and retention of content. 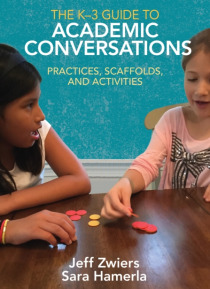 The K-3 Guide to Academic Conversations is that resource for providing your primary students with the same powerful learning opportunities.